A bobcat operator filling the skip bin - what do I need to know? Try to hide material in the bin that is excluded from our hire conditions. Bobcat operators quite often do things they would not do with their own trucks. Bobcat operators almost always fill the bin with greens first or try to hide material they know cannot be disposed of in a skip bin. Please advise them of YOUR LEGAL & CONTRACTUAL OBLIGATIONS. Bobcat operators tip at the same landfill facility we do & know the law - but most will try to bluff you with "she'll be right" or "we do this all the time". As the hirer of the skip bin you are the one responsible for any additional fees incurred. Please make sure your bobcat operator is aware of your skip bin hire conditions. For 99.9 % of our clients there is nothing to worry about. 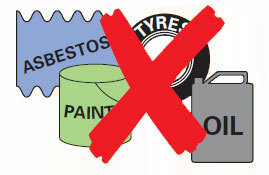 However for those who think they can conceal hazardous or controlled wastes, overfill the bin or not make the bin available for pick up or delivery there will be additional charges for any circumstance beyond our control as listed in the above link. Common sense prevails here – if you need the bin longer – call us so we don’t waste our time & fuel coming to pick your bin up. If you are a builder Don’t ask for your bin to be delivered at the same time you have a concrete pump on site- let us know so we don’t waste our time. If you are a home owner & you want your bin where your boat is – move it before we get there!! If you live in an area where there is plenty of trees or low power lines – look up before you order the bin, we need 5 metres of clearance to lower the bin. Our drivers don’t like “pruning” trees or risking electrocution!! If you need a machine to get the waste in the bin please read our maximum sized items permitted –to prevent damage to the lifter when tipping & operator safety. If you need a 6 metre bin….. then order it – don’t order a 5 metre bin & think we will transport it. Our drivers will not risk their licenses (which are their livelihood) to save you a few bucks, nor do they want bricks, steel or timber coming through the back of the truck when they need to brake. Unfortunately idiots cut in front of trucks on a daily basis. We continually ask customers to put their kids in the car & follow our truck back to the yard or down the freeway when they have overfilled the bin – you wouldn't do it to your family, so why do it to someone elses!! In short, if we turn up to remove your bin & it is unreasonable then you will be charged a wasted journey fee. The operator will endeavour to place the bin in your requested position. Moving the bin in most instances prevents the recovery of the bin & will result in extra charges for yourself & having to empty the bin out before it is moved again. Sometimes the skip bin cannot be placed where you want. This may be due to overhanging trees, powerlines or sloping ground. Moving the bin requires special lifting apparatus. The bin needs to be lifted evenly to prevent damage to the bin & the lifting equipment on the truck. Moving the bin with cars or bobcats damages the bins & could potentially cause the bin to collapse on pick up. Can the skip bin be placed on the road on in a public park? As a general rule - No. You can obtain a permit from you local shire if the street or park is not a major thouroughfare. You have to pay for this & have the permit faxed through to ourselves BEFORE the skip bin is delivered. As part of your permit conditions you will be required to provide flashing lights on each corner of the bin & bunting (orange safety barrier mesh) around the bin to prevent accidents. We can provide these items at additional cost if needed. Do The Bin Guys use a carbon offset scheme? All of The Bin Guys vehicle carbon emissions are 100 percent offset using Greenfleet Australia. For you this means that whenever our trucks are operating there is minimum impact to the environment. Many major corporations both business & government such as ANZ bank, Australia post & ASIC offset their emissions using Greenfleet & now we are proud that The Bin Guys do to. We believe that The Bin Guys are the only waste/rubbish disposal company in Western Australia that offset's 100% of our carbon emissions both in the office & on the road, making your business with The Bin Guys truly 100% carbon neutral. Do your skip bins have a door for access? Every single one of our bins has a door for wheelbarrow access. Even our small 2 metre bins. Always insist on a skip bin with a door - NOT A RAMP that leans up against the bin. The hirer is responsible for providing a safe work environment. Make sure you, your employees & sub-contractors are safe by using a skip bin with a door. You can either click on our "Bin Booking" or "Contact" buttons & fill out your details or call our friendly staff on 1800 884 884. You can pay our driver on delivery of the bin. We will email you your tax invoice to you. You may also pay over the phone or internet using our secure website by credit card. If you are not present when you wish the skip bin to be delivered you can inform us (when booking) that you will hide the payment in a secure place (such as your meterbox). No bin will be removed without payment. How do I safely dispose of dangerous & hazardous items? Contact your local council. Most have a free pick up or drop off point for ratepayers. Some waste fill facilities such as Tamala Park have free drop off for asbestos on the last Sunday of each month as a community service. This is in addition to free drop off of used paint, oil & herbicides etc. Please contact your local Waste facility or council for more details. The skip bin can be filled TO THE TOP OF THE BIN ONLY It's common sense really. If you purchase 2 litres of milk from the supermarket you don't take 3 litres do you. The same applies here. Overloaded bins pose a risk to the operator, the lifting equipment & other road users. Please also see our bin filling & bin safety pages. Our Normal skip bin rental period is 7 days. If you require the skip bin for a longer period please inform our friendly staff . Generally if it is only a day or two there is no extra charge provided you call before our driver arrives to pick your skip bin up. A wasted journey fee will be charged if you do not call!! Additional weekly hire is only $44 per bin per week. Your site needs to be clean & level for safe delivery, placement & bin retrieval. The truck is 2.5 metres wide plus the mirrors are 50 cm additional each side - we need a minimum of 3.5 metres if we need to reverse to place your bin. The driver also needs to open his door to get out - if you have low walls or hedges etc. take this into consideration. Look up - how much clearance from trees, eaves, power lines etc. is there? We need 6 metres minimum & 8 metres if power lines are present to comply with WA Worksafe legislation (The law). The driver requires 1 metre of clear unobstructed access around the bin to prevent injury, slips, trips or falls to do his job - this is your worksite you have asked us to enter - you are required under WA Worksafe legislation to provide a safe work site & comply with all relevant OH&S legislation applicable. Lastly you have arranged for the delivery of the bin, to avoid additional fee charges such as “wasted journey” or “waiting time” please ensure access is available on both the delivery & pick up day. How quick can I have my skip bin delivered? Depending on your location delivery can vary from a few hours to the next day depending on our workload. Our friendly staff can advise the lead time when booking. Our deliveries always take priority over bin pick ups so you can get on with your job. We do however recommend giving 1 days notice (book today & we will deliver tomorrow). If you need a bin for first thing in the morning have it delivered the day before. What are "fibre cement products"? Fibre cement products are all products that are manufactured with fibres & cement to make a solid product. Common examples are “super 6 ®” fencing, Eave lining boards, Exterior facia boards with a timber grain look & have many market names such as Hardisheet® or Hardiboard®”. This also includes older fibre cement products with common names like “Fibro” or “Weatherboard” & include items such as boundary fencing, Exterior home cladding & other products such as down pipes, gutters, fence capping, electrical mains boards and the like. In order to comply with State Government workplace legislation, along with new guidelines set out by the DEC we can no longer accept fibre cement sheeting in our skip bins from 1 July 2014. For Hazardous waste disposal we can supply an alternative hazardous waste disposal product called “Hazibag” ® – which is a fully enclosed bag complete with bladder – call for pricing. Liquids such as Oil, Paint, Thinners. Make sure you have access for the truck. Advise your contractors to leave room for the delivery of the bin & the pick up of the bin when full. Make sure there is no overhanging tress or powerlines (7 metres clearace required to comply with OH&S). Make sure your car, boat, or caravan is moved if needed PRIOR TO THE BIN BEING DELIVERED & that car keys are available for vehicles on site if needed. Make sure you have not placed your rubbish where your skip bin is to be placed. As a rough guide a loaded standard 6' x 4' box trailer is about 1 cubic metre or about 10 barrow loads. If you think you have 4 trailer loads of rubbish then a 4 metre bin is the one for you, 6 trailer loads is a 6 metre bin & so on. When will you pick up my skip bin up? We will automatically pick your bin up the following week on the same day it was delivered. This ensures that you get a full week for your bin. If you need you skip bin longer please call before our driver arrives to collect your skip bin in order to avoid a wasted journey fee. REMEMBER if we deliver your skip bin on a Monday, 7 days is till Sunday there is not 2 Mondays in any week!!! Please do not tell the driver that the bin was delivered at 2pm, when the driver turns up to pick up the bin at 10am & ask for the bin for another 4 hours. Who is responsible for the skip bin? If your employee's or neighbours fill the skip bin on your behalf you are responsible for making sure it is filled to our requirements. Should you find hazardous materials placed in the bin you must rectify this before filling the bin any further. Additional charges will be passed on to the hirer at the prevailing rates for bins that have been moved, overfilled, filled incorrectly or contain hazardous materials. By accepting delivery of our bin you acknowledge & agree to this condition of use. Why can't we give you delivery or pick up time? There is many reasons why we can’t do this – most important is that we don’t lie to you in order to get a bin order or create delay on your project. If you need your bin first thing in the morning, there is no extra charge to have it delivered in the afternoon prior to the day you require – we just need to be advised (help us to help you). Some things to consider that we encounter daily are listed below that we have no control over, it only takes each driver to be held up 2 or 3 times first thing in the morning by 20 minutes on each delivery plus a bit of heavy traffic to ruin the whole days schedule. Wet weather – trucks take longer to brake in the wet so we tend to drive more cautiously for your safety on the roads. Car accidents – besides delays from “rubber necking” sometimes roads can be closed if a serious accident occurs. Natural disaster – fires & floods broken gas & water mains as well as fallen trees & power lines. Road works both advertised that we are aware of & unplanned or local government road works who do not advertise or advise of road works or road closures. Road closures – unadvertised (western power, tree loppers, water & gas as well as cranes lifting swimming pools or building materials. Traffic – unexplained – some days it seems the traffic lights are out of sync or just more people are using a route that normally carries less traffic. Boats caravans & cars parked in the way of where the bin is supposed to go. Locked gates, not answering the door or phone & not being at home or leaving payment. No keys on site to open gates or move parked cars etc. All of the above on pick up plus bins that are overfull & unable to be picked up.